Theme: God’s faithful and generous people trust God in all things and believe that God equips and empowers us with gifts for ministry. Maybe we need a little more “motherly intervention” in our churches and in our own lives of faith, so that we can take the light of Christ into the world and share the good news. And, yes, there’s good news aplenty in this week’s lessons. An important lesson we can take away from them is that all of us have been given spiritual gifts that are activated by the Holy Spirit, and when we use these gifts together as the Body of Christ amazing things can happen. What we need to add to the equation is some trust and some faith. We have to believe that what we have been promised can and will happen. Even Mary believed who her son was and trusted that he could do what she needed at that wedding feast long ago. Dear church, we CAN do what God calls us to do. We CAN follow Jesus, thanks to the gift of the Holy Spirit working in us. We CAN share the good news, love God and our neighbors, and shine with the light of Christ. We CAN use the variety of gifts in our beloved communities for the common good. As Mary did with Jesus, we can affirm the gifts of others and encourage them to use their gifts when there is need or opportunity. We can trust that these gifts have been given to us and to others to be shared, not hoarded. Sometimes people need a little help seeing the talents and gifts God has given them. They need to be invited to participate, to share, and to develop and use their skills, creativity, hands, hearts, and minds for the sake of mission and ministry. Rather than simply passing out “Time and Talent” forms once every year, seek out those who possess gifts that are needed in the community. Encourage one another in the name of Jesus and trust that just like the good wine came last to that wedding feast at Cana, so will our gifts grow and mature in service to God. We are, you and I, all of us, everyday miracles nurtured by God’s amazing love. Give worshipers a strip of construction paper when they enter. During the sermon invite them to write on that paper a spiritual gift they believe God has given them. 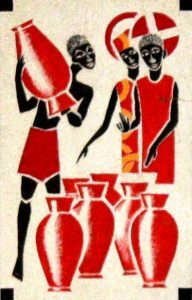 Invite them to bring the strip forward as they come to communion and place it in a basket or bowl. When you are ready to give the sending blessing, hold the bowl and offer a prayer for the gifts of the congregation. Ask the Holy Spirit to activate these gifts in new and fresh ways for the common good. Then bless the people and place the bowl on the altar. Before next Sunday form a chain with the gifts and display that chain somewhere for all to see. Explore this week’s psalm with the youth. This excerpt talks about God’s steadfast love and what it looks like to the writer of the psalm. What does God’s faithful, abiding, and eternal love look like to them? How have they experienced God’s love? How might this psalm be written for today, for this place, time, and people? This week’s focus verse is 1 Corinthians 12:11: All these [gifts] are activated by one and the same Spirit, who allots to each one individually just as the Spirit chooses. Before Sunday, prepare certificates or medals for the children with a blank space on which you can write their name and a gift you see in them. 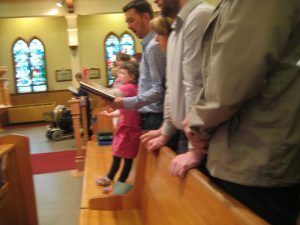 Talk with the children about the epistle lesson, and how the Holy Spirit that we receive in baptism gives all of us unique gifts to be used for the common good. For each child, write their name and a gift you see in them on the certificate or medal. For example, you might have “Spencer the Cheerful” and “Lucy the Kind.” Remind them that each gift is wonderful (just as they are), but together our gifts are absolutely amazing—when we use them for the common good and to share God’s love. Finish with a simple prayer and blessing. You are uniquely gifted by the Holy Spirit! The same Spirit you received in baptism now activates gifts for the common good in you. What are these gifts? How are you being a faithful steward of what you have been given? Take time this week to identify gifts in others. Really focus on the people you encounter and ask God to help you see their gifts and talents. Pick at least one person to whom you can write a personal note, email, or text thanking them for the gifts you see in them and letting them know that you are praying for them this week. If there are children in your home, spend time helping them to identify their gifts that can be used for Jesus. Affirm these gifts and help them cultivate their gifts and talents. Remind them that Jesus loves them—not because of their gifts—but because they are children of God. That unmerited and everlasting love comes before any gifts and talents! In fact, the gifts and talents pour forth because of that love. 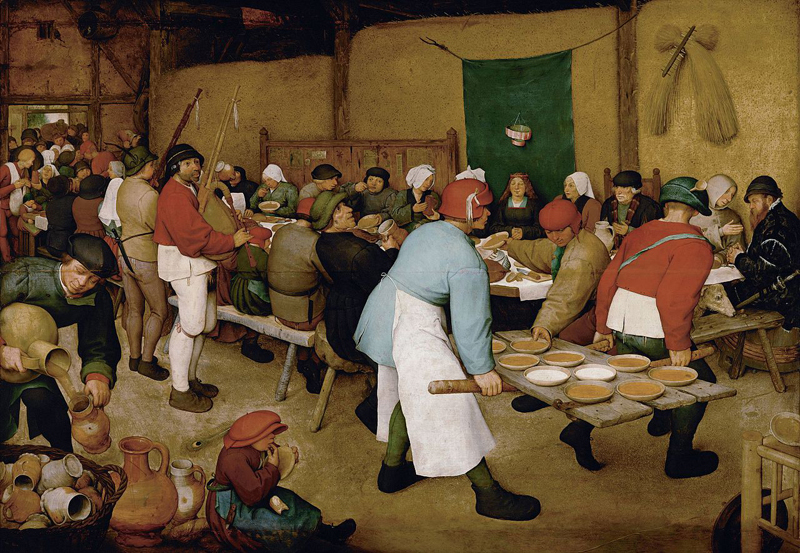 Photos: Pieter Bruegel, Father Georges Saget, Art in the Christian Tradition. Creative Commons usage license. Thanks!